HomeNewsProcess ImprovementHow to use AQL sampling to determine if goods are acceptable or not? Why should I use AQL sampling and inspection to better manage your product quality. What’s the different parts of an AQL table and how to interpret it. What’s the popular alternatives to using ANSI/ASQ standard Z1.4 for product inspection. Why importers typically rely on AQL sampling, rather than other sampling methods, for product inspection. How QC professionals use AQL results to determine an overall inspection result, and how these determine whether you should accept the shipment? Though there are many quality control tools, but not every importer has highly strict standards for their products. whatever almost every importer need to find and address any excessive or serious defects with their product before shipping. Adopting AQL will help make sure any quality issues are caught in the factory and don’t make it anywhere near your customers. Even today, international trading covers all the global, quality control remains one of the most challenging aspects of manufacturing abroad. 62% manufactures or importers said that “managing product quality” was their biggest manufacturing challenge. That’s more than triple the number of visitors who responded with the next most common answer, “finding the right supplier(s)”. Many importers don’t know how to approach the problem of poor product quality. Others know that pre-shipment inspection is an important part of the process but aren’t familiar with their options for conducting inspection like how to using AQL table etc. I don’t understand AQL table, could you explain for me if the shipment can be send out or not? Why not just pull an arbitrary number of units for inspection, e.g. 10 percent or 15 percent of the order? How does AQL determine the result of inspection? How do I interpret the AQL table? AQL can seem daunting to many learning about it for the first time. But you’ll get more insights from any AQL inspection of your product by being familiar with the standard behind its results. As we call every shipments need AQL sampling inspection before sending. Some importers being overwhelmed by technical jargon, though QC professionals have experience in explain to importers what AQL table means and how it’s used during inspection. there’s still one problem—most importers aren’t engineers. And they probably never heard what’s “operating characteristic (OC) curves”, “Pareto charts” , “Consumer’s Risk” and the complicated formulas most QC professionals are privy to. 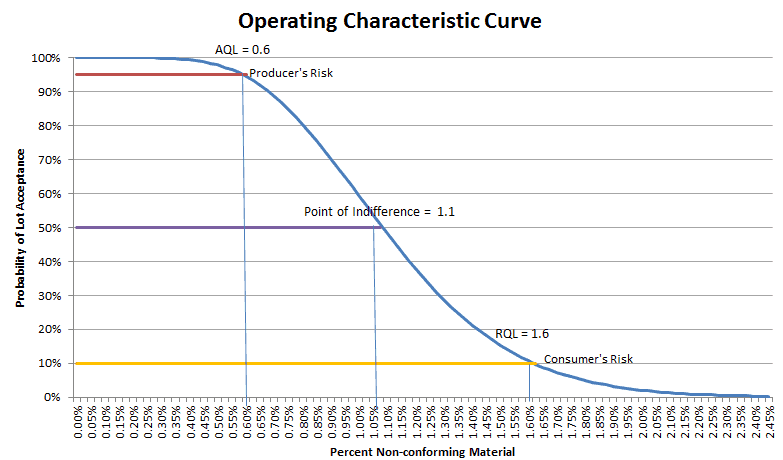 What’s Operating Characteristic (OC) Curves? Because as a trading importer, you will not interest with those long-winded and technical information about quality control tools. Some importers manage the quality of their products by delegating product inspection to skilled professionals, often with little understanding of the process. But we suggest you to get the most insight possible about the quality inspection standards and know how to use then for control the quality of your shipments, it will not spending too much time and money checking, just empower yourself to make more informed decisions and good for you and your suppliers.